Winco PUTF-6C Polycarbonate Flat Grip Tong, Clear 6" is a versatile kitchen utensil that can have many uses in your commercial kitchen. With its flat grip serving ends, guests can easily transfer food from the serving platter to their plates without fear of dropping items. Its polycarbonate construction and clear color also means that these tongs can be used instead of ice tongs or to grasp other smaller items from the salad bar. 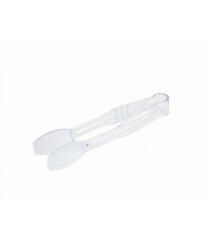 Dishwasher safe and easy to maintain, these tongs will last a long time at any food venue without scratching or staining. Winco PUTF-6R Polycarbonate Flat Tong, Red 6"